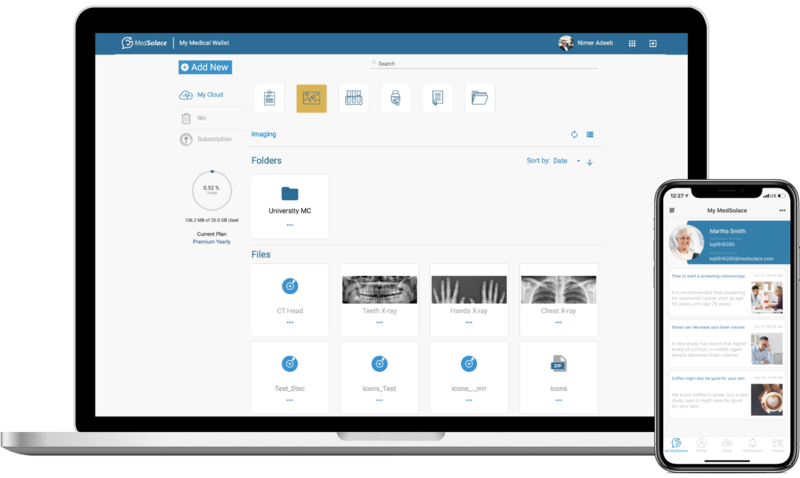 MedSolace is the first HIPAA-compliant application that provides users with a personalized and highly secure cloud space to which they can easily upload their medical records, diagnostic images, lab results and more. Users will also be able to track their medical records and images uploaded by medical facilities, and share data with medical professionals remotely using a unique MedSolace ID. 71A1902B-DC26-4663-9F39-8AE657CB11FA Created with sketchtool. 71A1902B-DC26-4663-9F39-8AE657CB11FA Created with sketchtool. For support and other inquiries, please send us a message. F20279A0-F332-4495-BF8E-7F1C63FED67D Created with sketchtool. B5873284-559F-4F8E-AFDE-D7436936533A Created with sketchtool. A3B793A0-EA76-41CF-9CD8-C6E469B17B8F Created with sketchtool.